By default, your Windows system gathers all information on your connections automatically so that it works out of the box when you plug in your LAN wire or put on your router or hotspot. 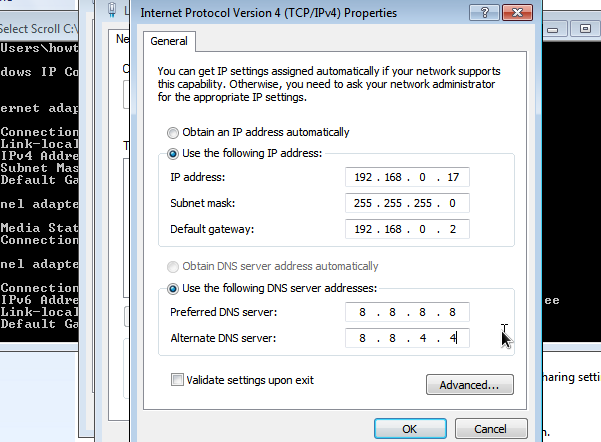 The subnet and gateway are detected and you are given one of the free local IPs and your provider's DNS Server. That works really good in most cases but in working environments or during LAN parties etc. you will most likely need a static local IP so you don't conflict with other machines in the network and your IP stays the same even after restarting the router or unplugging the system. To configure a static local IP, first find out what network data you currently use. Leave the command line window open since you will need those data if you don't know them by heart. By not obtaining the IP address automatically you also are deprived of the option to obtain the DNS servers automatically. You now have to enter a primary and secondary DNS Server of your choice - I use Google's servers here (DNS servers are there to kind of translate domains like example.com into IP addresses, so you are displayed the correct websites upon entering their domain in a web browser - there are public DNS servers offered like the ones I use above; feel free to take the same of look for others).